Before anyone cries foul over my statement that TRICK ‘R TREAT is the single best Halloween-themed movie ever made, allow me to back up the statement. While 1978’s HALLOWEEN is a masterful, amazing thriller that truly has no equal in the horror genre, TRICK ‘R TREAT is something wonderfully different. Its a movie that IS Halloween. Whereas Carpenter’s classic is set during the holiday and it plays heavily into the plot, the film could (arguably) be set on any other night and be just as frightening. TRICK ‘R TREAT hinges completely on All Hallow’s Eve, taking every spooky childhood memory its viewers have about the holiday and mashing them into a gleeful, creepy anthology of tales that are somehow both genuinely chilling and nostalgically beautiful. Try as I might, I cannot think of a film more deserving of a 10/10 rating than TRICK ‘R TREAT. Writer/director Michael Dougherty has crafted a film that transformed me into a five-year-old child in a Dracula cape and plastic fangs, riveted in stunned horror as his vision played out before me. Somehow, it succeeds in being both terrifying and charming, like a dark old painting that still reminds you of home. TRICK ‘R TREAT’s story unfolds unlike a traditional anthology picture, with all of the movie’s separate plots taking place together. We’re not subjected to title cards or stunted intermissions between tales, but a seamless mix of Halloween hijinx and horrors. In its five overlapping stories, a couple discovers what happens when they blow out a jack o’ lantern before midnight, a bullying child learns to check his candy before eating it, a young woman is stalked by a hooded stranger at a harvest festival, a group of pranksters uncover the ghoulish truth about a local urban legend, and an elderly Scrooge is visited by a pint-sized hellion who is far more interested in tricks than treats. 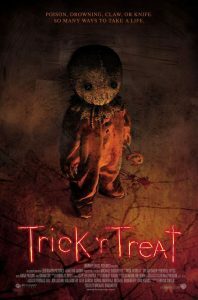 Buffeted by wonderful performances from Oscar winner Anna Paquin, Emmy winner Brian Cox, Dylan Baker, Leslie Bibb, and Battlestar Galactica’s Tahmoh Penikett, TRICK ‘R TREAT is the one and only genre film to have been released in the past decade that is already one of my all-time favorites. When its done, you’ll feel sorry for the works of Tim Burton and Quentin Tarantino, because TRICK ‘R TREAT has taken the best of these auteurs, blended them with ten pounds of candy corn and razor blades, and shoveled the whole mess down your throat. TRICK ‘R TREAT may not just be the best Halloween-themed movie ever made, but the finest example of horror cinema in decades.